The ocean's influence dominates the world's weather systems and supports an enormous range of life. This first episode demonstrates the sheer scale, power and complexity of the "Blue Planet". 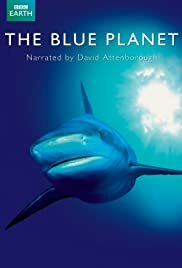 How many episodes of The Blue Planet have you seen? I highly recommend you watch this series. To see the angler fish outside of the small pictures shown in textbooks is truly a treat, but only a needle in the vast haystack of the sea that Blue Planet covers. From the open ocean to tidal pools, coral seas to the deepest darkest part of the ocean itself, the BBC takes the viewer on an almost magical journey through the ocean. I have to admit, one of my earliest dreams in life was to be a marine biologist, and after seeing this series, the dream was revived. I have studied the oceans of this world for years, and have seen countless documentaries on coral reefs and dolphins, whales and crustaceans. But in all, no one has managed to capture the life beneath the waves quite as well as this group of people. Watch the 'Blue Planet' series in it's entirety, I promise you won't regret it.